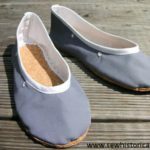 I made shoes again! 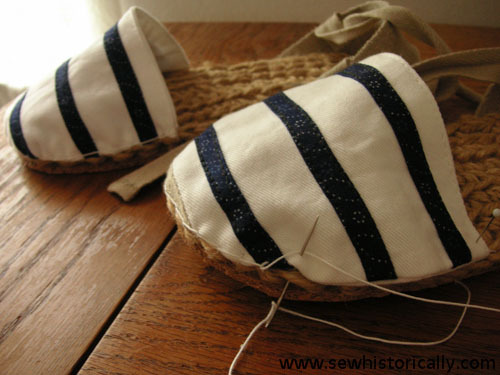 This time I made nautical striped espadrilles with crochet jute soles and cork outsoles. 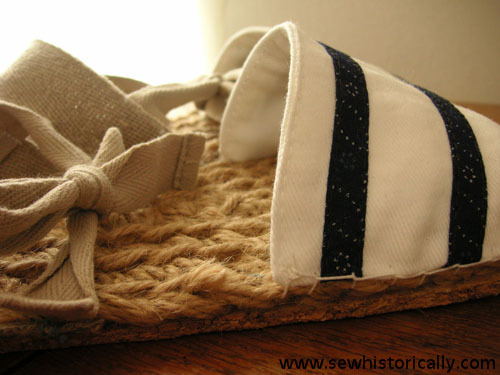 I crocheted a sole with jute rope. 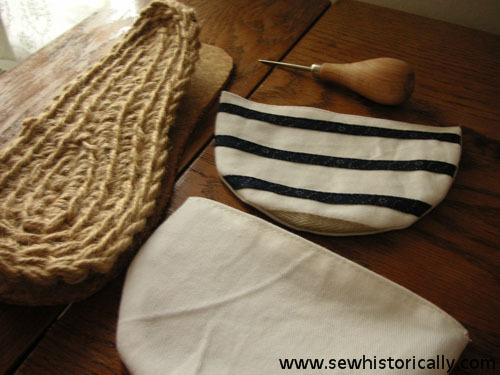 I used the same sole pattern as for my 1920s bathing shoes. 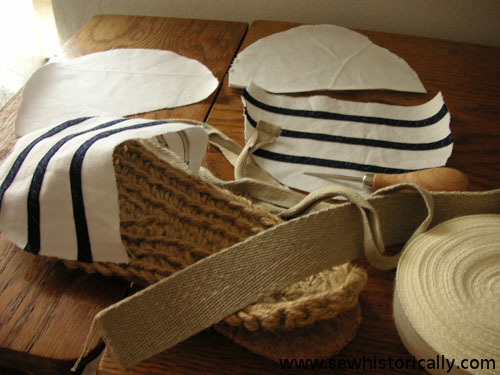 Then I adapted the bathing shoe pattern for the espadrilles uppers. 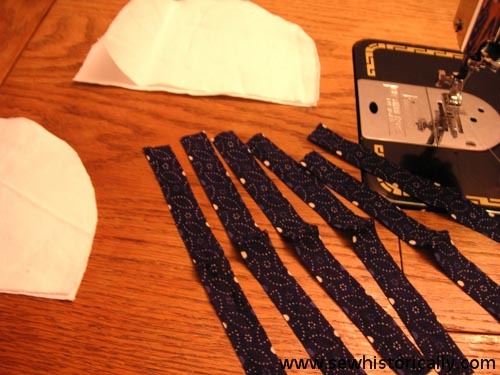 I added cotton webbing at the tip of the shoe uppers. 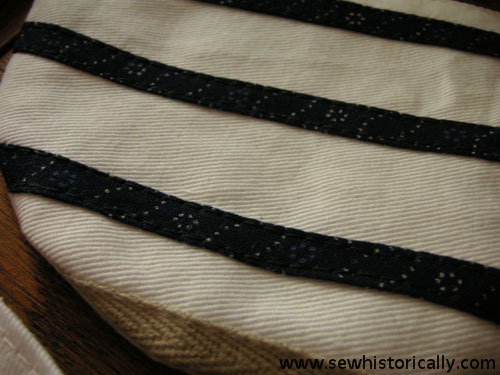 The uppers are made with two fabric layers with the raw edges hidden inside. 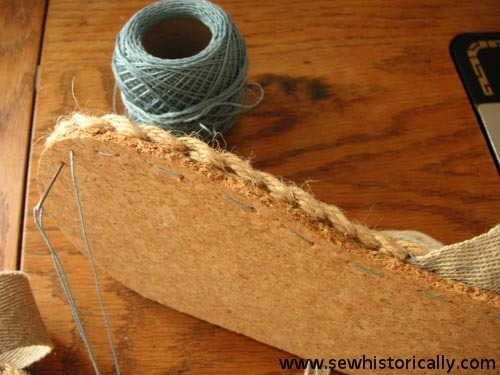 Using running and overcasting stitches, I sewed the linen webbing to the bottom of the jute sole. 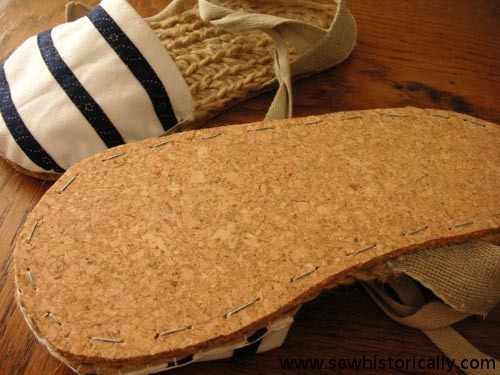 I cut two soles from the cork tile. 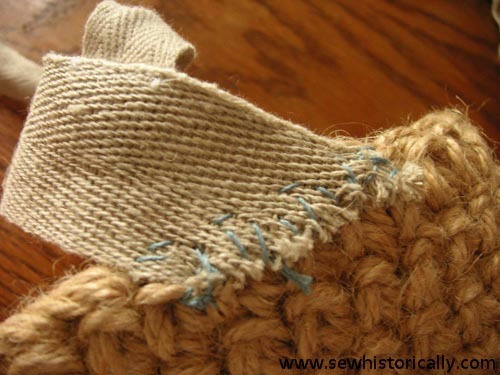 Then, using running stitches, I stitched the jute and cork sole together with blue crochet thread. 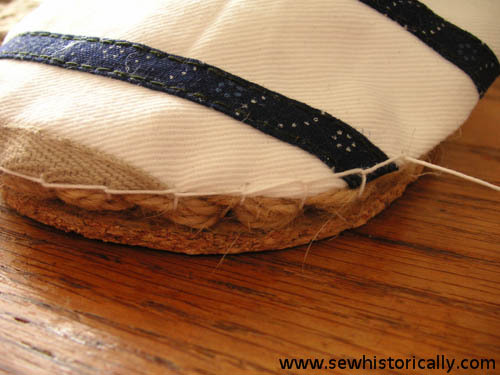 Espadrille uppers are usually attached to the sole with blanket stitches. I used white crochet thread for the blanket stitches. And they’re really easy and fast to make. Now you make that look easy! 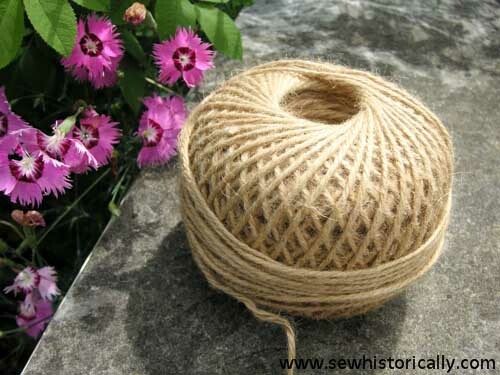 I know you need a thimble. So cute! They are really cute. Are they comfortable? Thanks, Ginny! 🙂 Yes, they’re really comfortable. Lina, Love these! 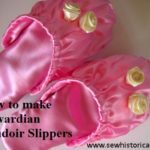 Can’t wait to try to make a pair for myself! Thanks for sharing. Thanks, Laurie! I’d love to see yours when you make them! 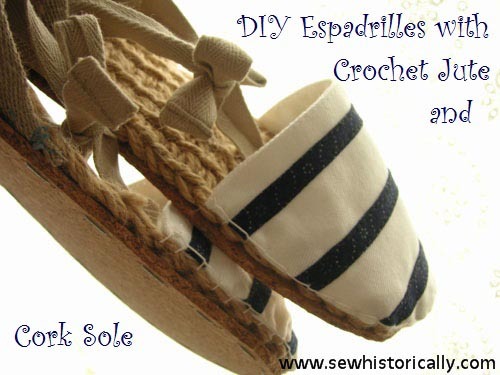 What a fun idea, I love espadrilles but have never thought to make my own. 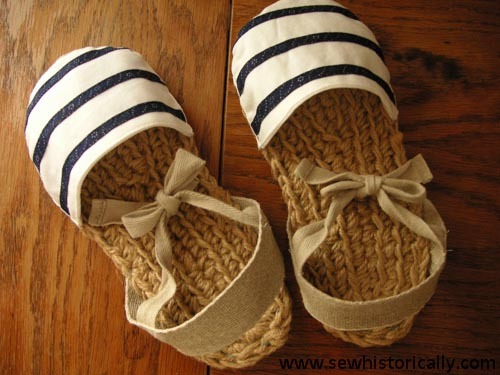 Wow, you made those espadrilles from scratch!! They are quite common here and also in Catalonia, and we have slightly different versions as kind of high-heel ones. 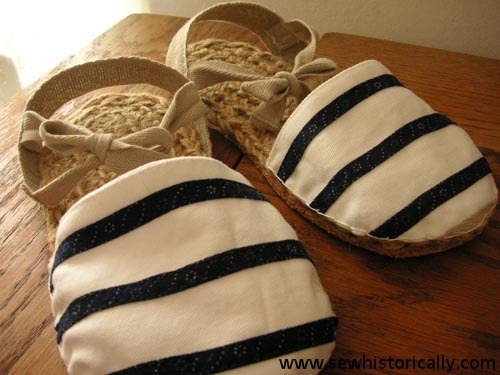 Love the nautical look you gave yours and I am sure they are comfortable too. Thanks for sharing them with us at Sweet Inspiration, enjoy the weekend! 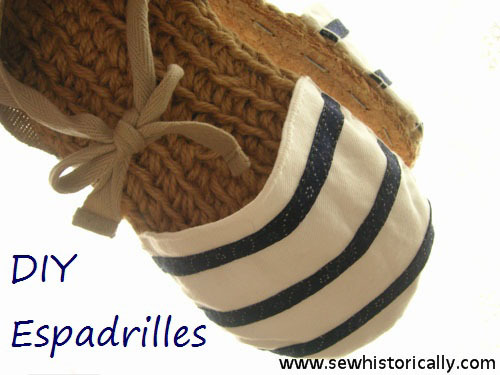 Lina your adorable espadrilles are my feature this week over at Sweet inspiration Link Party! Congrats!! Thanks for featuring me, Mary! I would be super happy too Lina. They turned out beautifully. Love the whole look of them and they look really comfortable. Great idea! They look fabulous! Lina, these are so fun! Thanks for sharing @Vintage Charm! These are really cute. 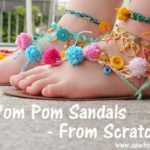 I DIY lots of different items, but making my own shoes never crossed my mind. Your talent is amazing, thanks for the inspiration. Thanks for your lovely comment, Leanna! 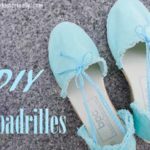 🙂 These espadrilles aren’t so difficult to make. I love these! Your projects are very inspiring ? 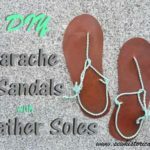 Will you publish a pattern for the crocheted inner soles? Thank you, Laurinda! 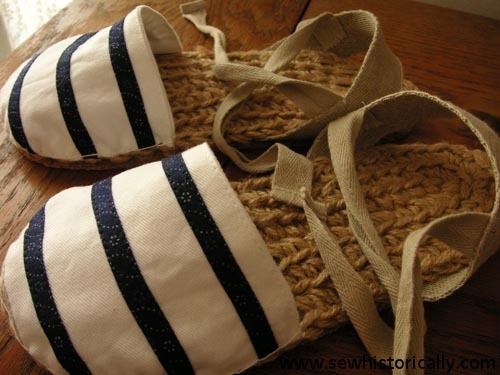 🙂 I used a pattern which I found online: Just search for “crochet sole”. Can’t wait to get started! 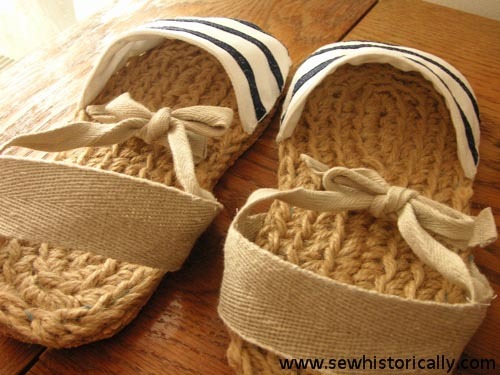 Just one question: how did you crochet the jute soles? 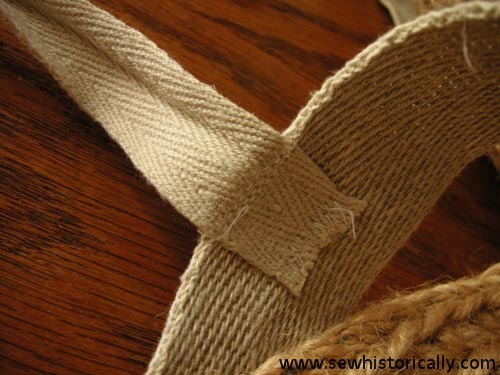 Did you use a pattern, and are those double crochets? Impressive!! You are very talented. I live in Florida and these shoes would be great. Hats, ah, shoes off to you.